Aberdeen Tavern’s 1st Anniversary Bash! Since I moved to Hamilton, the Aberdeen Tavern has been at top of my list for restaurants to try. Why I hadn’t made it there until last night is beyond me. I mean, besides the fact that I work like a dog and only have time to sleep, eat and (sometimes) get to the gym, I don’t have much time for myself. In any event, around the month of April, my shifts with the city are cut down a bit and it gives me some free time in the afternoon and evenings. So it was with great excitement that I accepted an invitation to the Aberdeen Tavern’s 1st birthday bash from my new friend, Justin Baisden. Justin is a fellow Hamiltonian and runs the food blog, Eating Your Content. If you live in the Hamilton area and love anything to do with food, you’ve probably heard of him. I have to admit, I was pretty damn nervous to attend this. I’m fairly new to the whole blogging scene, let alone being invited to media events full of professional foodies, so I wasn’t sure what to expect or how to act. Once I got there, after a few minutes of chatting and two (delicious) cocktails, I realized I was in a room full of people who shared the same passion as I did. 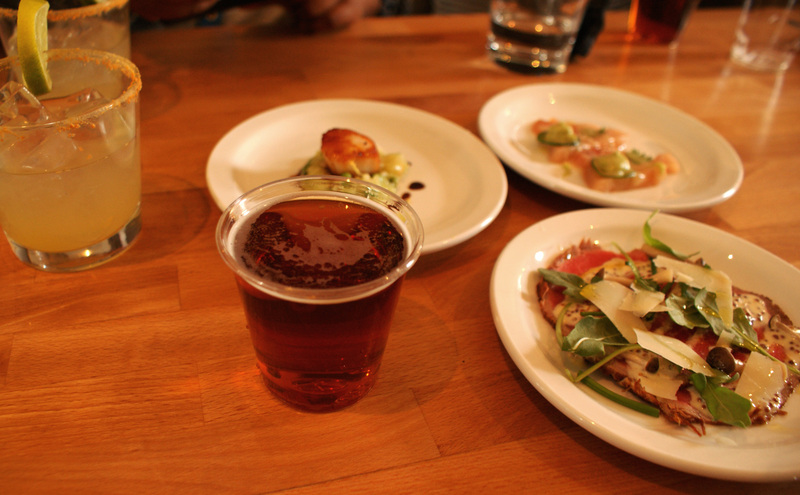 As the appetizers started to flow from the kitchen, I began to relax and find my groove. It’s amazing how food brings people together. I had the pleasure of meeting Avi, who served me up a couple of cocktails (okay, a few) that were so delicious. My favourite was definitely the Key West Collins (left side of the picture) which incorporates bourbon, lime juice, bitters, soda and Galliano liqueur, rimmed with graham crackers! It was a perfect balance between sweet and sour, super refreshing (will be an amazing patio drink in the summer) and paired beautifully with the food we were tasting. I also tried one of the draft beers which was also delicious. Needless to say, it was a great start to the evening. 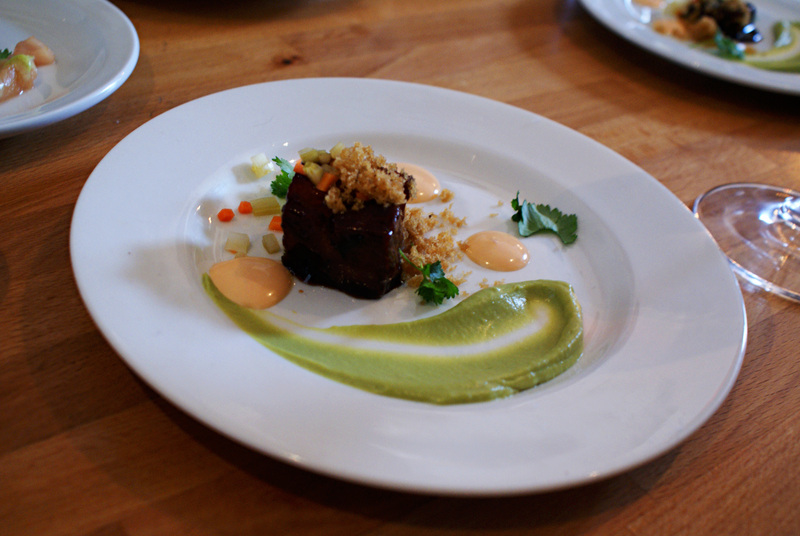 The above dish is the Hoisin glazed pork belly with avacado, pickled carrot, chili aioli and coriander. This was only my second time trying pork belly. I’m really starting to become a fan of this stuff. 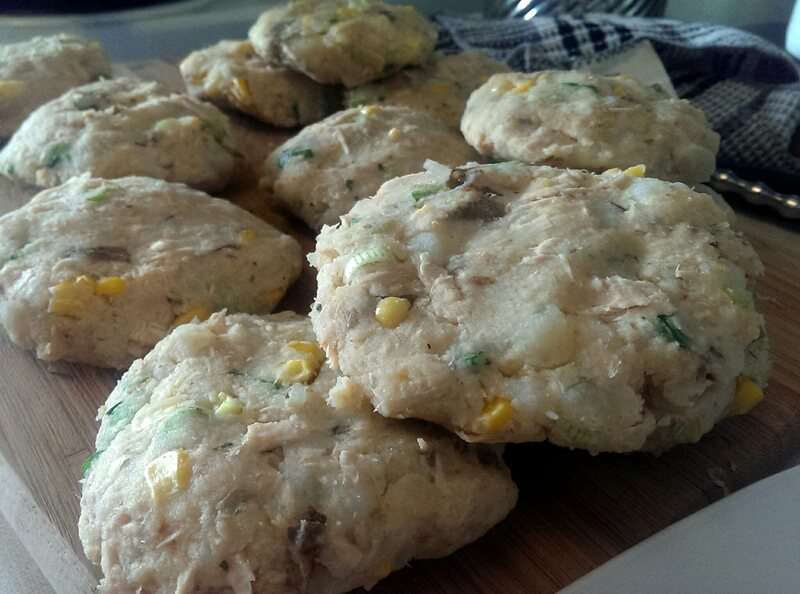 It’s crispy on the outside, soft, warm and somewhat juicy on the inside. Definitely a dish you need to savour and let melt in your mouth. 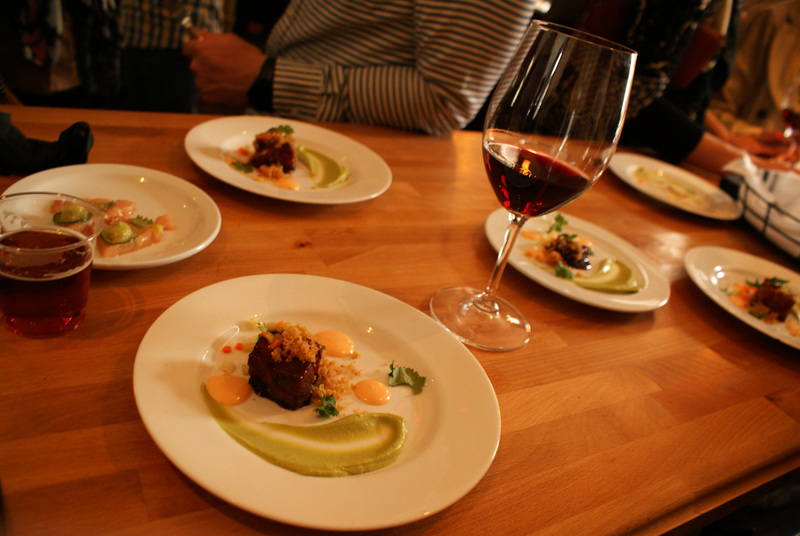 Plus, there was some sort of crunchy garnish that really added a nice contrasting texture to the pork belly. I have no idea what it was. Maybe someone can clear that up for me in the comments below. Funny side story: this was the first plate I tried and as I’m marveling at its beauty, with my fork I attempted to unsuccessfully slice it in half. Not knowing my own strength, I managed to push the pork belly off the plate and onto my shoe. What a waste *tear* I still have the stain from its impact on my shirt and shoe. Not to worry dear reader, I made sure I consumed at lest three more plates of this delicious meaty goodness to make up for the lost one. RIP. 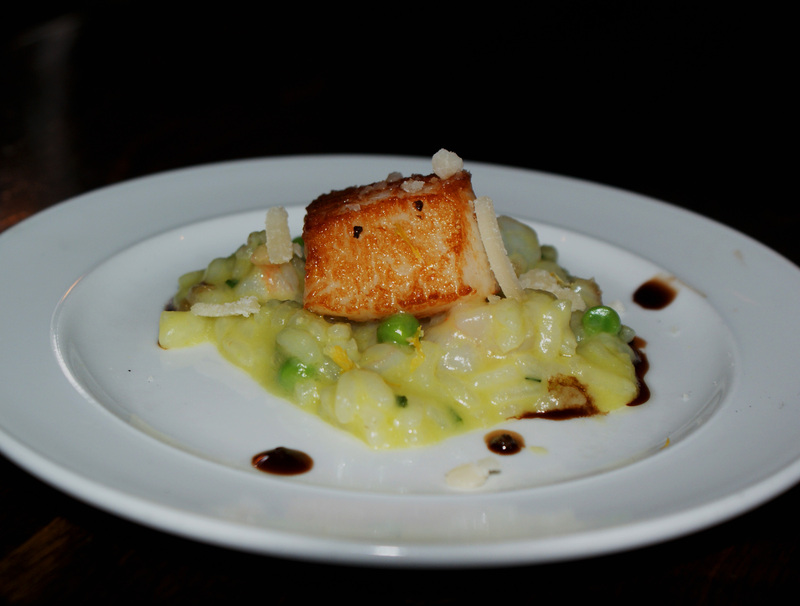 Next up was the Scallop and Sweet Pea Risotto with black tiger shrimp, parmesean and *wait for it* fifteen year old balsamic. This dish was a top contender for me. 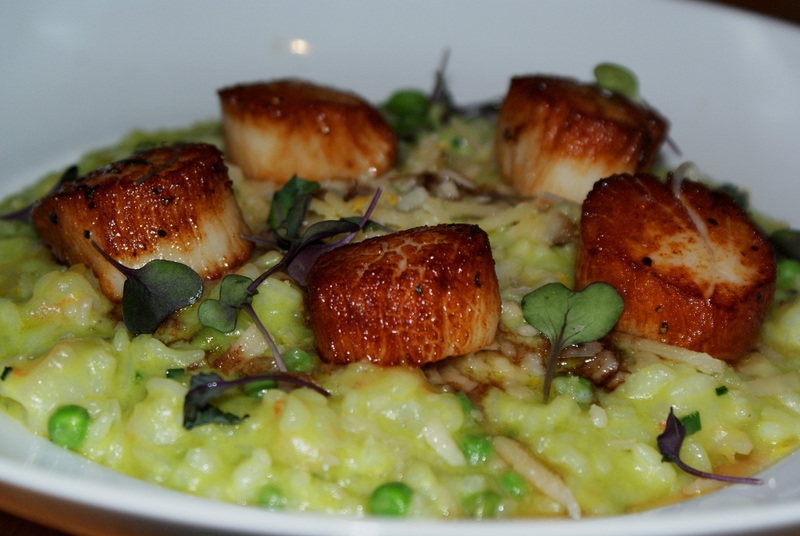 I love a good risotto, especially when done right. Let me tell you, this risotto was perfect. It was soft and creamy with an added cheesiness of parmesean. The scallop was a great way to prepare your mouth for the rush of flavour that was following it. It was perfectly seared on all sides, crispy and full of flavour. The balsamic was a great finish in this dish as it added a sweet and salty component that really worked well with the other ingredients. This dish was a first for me. 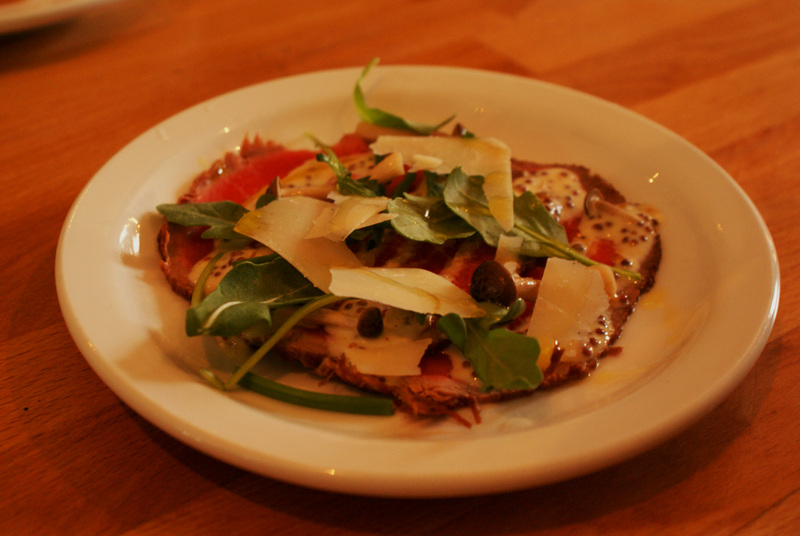 The Beef Carpaccio with mustard sauce, pickled honey mushrooms, arugula and parmesean was something I have never tried before. Believe it or not, I’ve never had raw meat like this before. It was so refreshing and flavourful I couldn’t figure out why this was the first time I was trying it. Better late than never, I guess. I’m extremely happy I tried it here. Although, a knife might have made it a bit easier for me to chow down on. A full slice really fills up the mouth and I found myself spending some time breaking it down before I could finish. However, that didn’t stop me from trying this dish a couple more times. The mustard sauce was so aromatic and really danced on your taste buds with the chilled meat. A fantastic compliment of flavours, temperature and texture. Bravo! 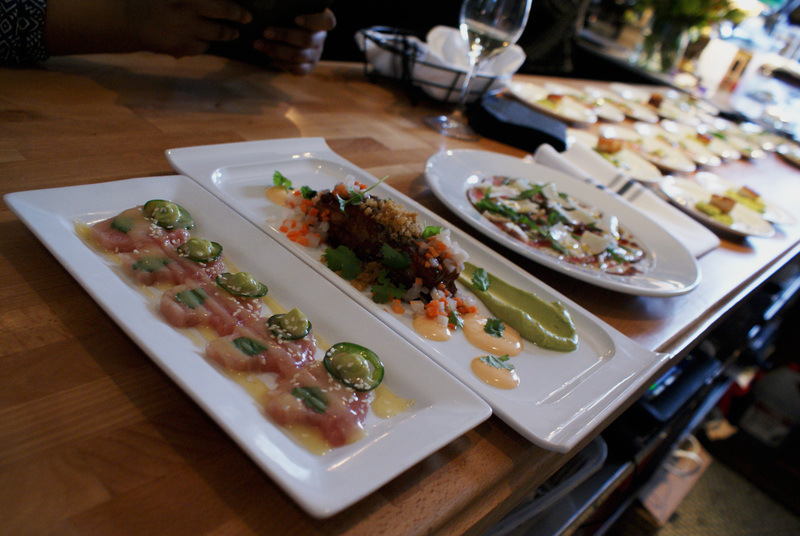 Next up was the Albacore Tuna Sashimi with jalapeño, avocado puree, cilantro and a yuzu miso vinaigrette. I’m not as much a fan of raw fish on its own as I am now of red meat. I’ll kill five sushi rolls on any given day, but I’ve just not found myself interested in sashimi. That was of course until I tried this. I really enjoyed that it was thinly sliced and paired with more intense flavours. The slice of jalapeño with the miso vinaigrette was what made this dish really stand out for me. I’ve got a serious crush on cauliflower lately and this just made me want to get down on one knee. 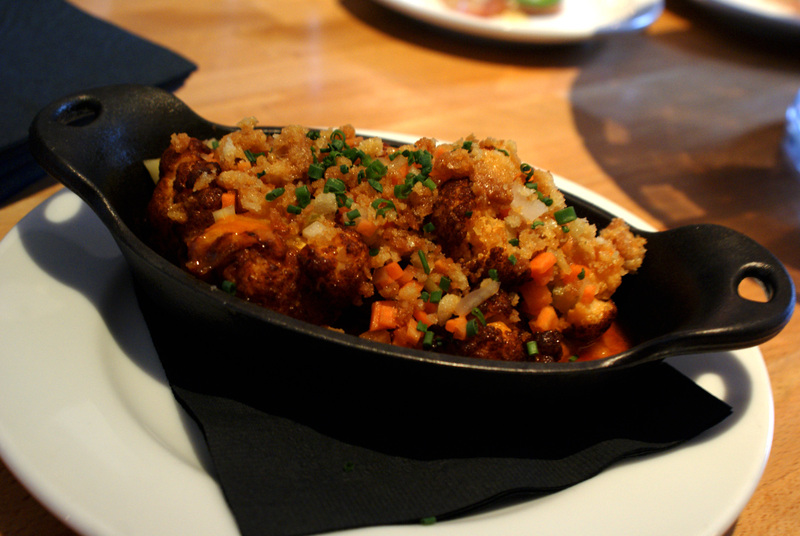 The Buffalo Roasted Cauliflower with pickled crudite and blue cheese dressing was my winner for the night. It was so crispy and juicy at the same time and combined with the kick of buffalo sauce, it was just a delicious punch in the mouth. As the evening progressed I noticed they hadn’t continued to pump out the cauliflower like they were with the other dishes. As my anxiety around this realization began to build, to my relief, more arrived. This time they were served in a cast iron bowl, so all the delicious sauces collected at the bottom for me to scoop up and drizzle on top. So so so good! After all was said and done, I am very thankful I was invited and welcomed so warmly to this celebration. As a new comer to this city, new beginnings can be pretty overwhelming. Hamilton and more specifically the Hamilton food scene has welcomed me with open arms. The Aberdeen Tavern is a place that most Hamiltonian’s are very familiar with and whenever I bring it up to someone who lives here I always hear wonderful things about it. This event definitely met my expectations and I can’t wait to visit again soon. Especially for patio season! So, thanks to everyone who I met last night and made me feel like part of the family! Cheers! So, I celebrated my birthday this past weekend. Another year closer to 30 (yaaaay…). I have to tell you though, I’m not that depressed about it. I’ve got a good feeling about what my 30s will bring, especially if things keep going the way they are. In any case, birthdays (for me at least) give me an excuse to eat whatever I want and share the experience with loving family and friends. One of my mothers friends suggested we try a new restaurant in downtown Burlington, Table 34. 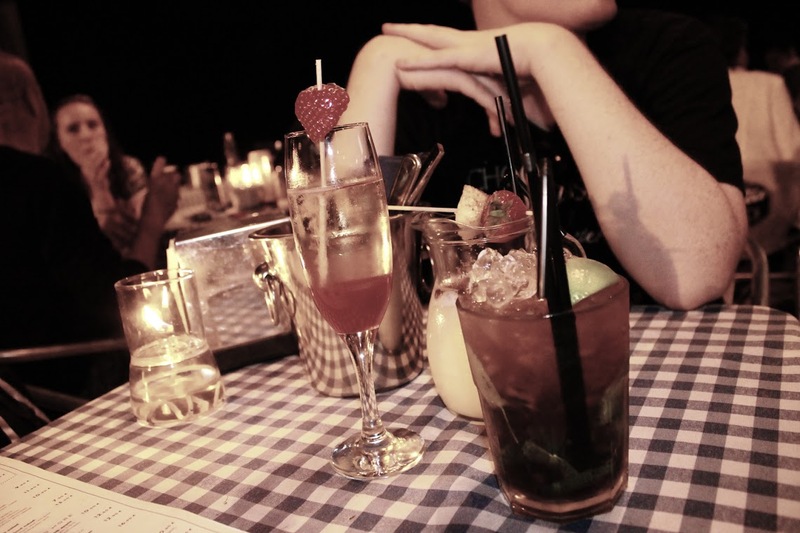 It was a great evening, with impressive food and great staff. As a new restaurant there’s a couple things to improve on, but that’s all a part of the experience. None of the issues that came up were nearly big enough to deter me from visiting again. The owner, Moe, was attentive, very accessible and present in the restaurant and quick to respond to any questions or concerns. Note: I apologize for the terrible picture quality. I’m just starting to get comfortable with my DSLR and I hate a flashing camera in a busy restaurant. So, I held off and used my phone’s camera. Sorry! I started off with the chef’s Caesar salad (no picture *blame hunger). It was a deconstructed salad with romaine leaves tossed in a house dressing, a slice of bacon and fried a Parmesan chip. The salad was good, however I found there was way too much dressing on the lettuce which really weighed it down. I’m also not a fan of chopping up my own salad. Especially if I’m having it as a starter, I want to be able to just dig in once it hits the table. This is just my personal preference and by no means takes away from the quality of the salad. The portion was large enough for two people to share and was a great way to start the meal. 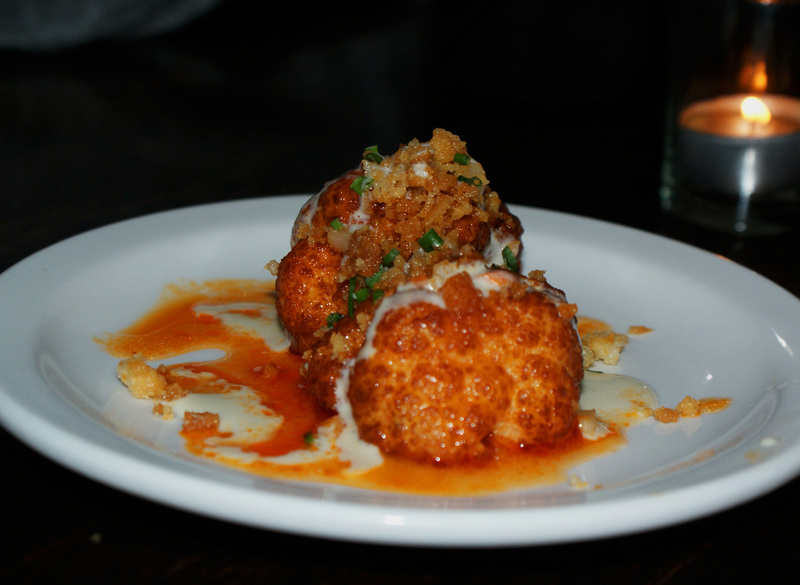 I really enjoyed the fried Parmesan chip, who doesn’t love crispy, fried cheese! I had the pizza special (obviously – if you don’t know me by now, I love pizza). I couldn’t believe the size of this thing. It’s definitely something you can share with someone you trust. FYI – Never share your pizza with an untrustworthy person. For the price (I believe it was around $21), I would expect it to be this big, approximately a medium. They used a bolognese sauce as the base which was incredible on the pizza. 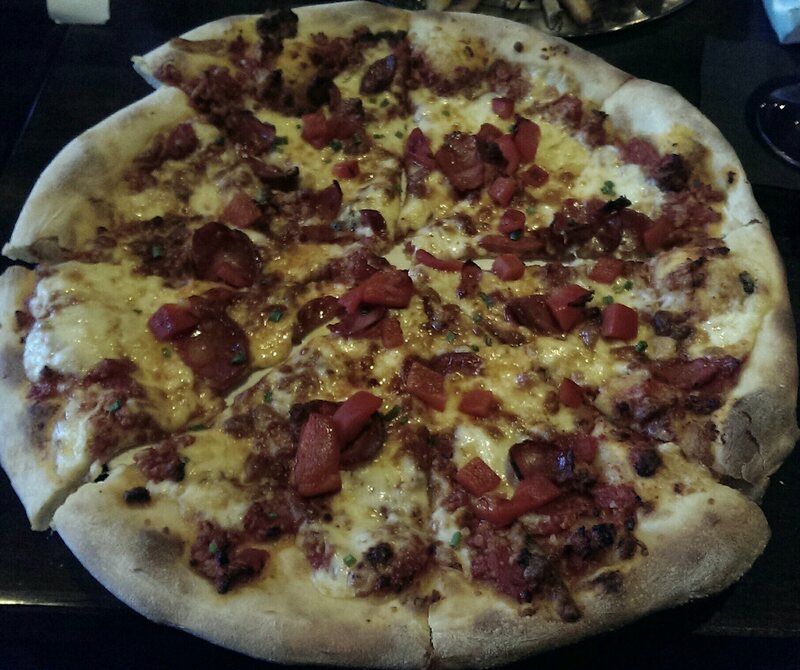 It had a perfect balance of ground beef and light tomato sauce which really added to the overall flavour of the pizza. The dough was thin crust and cooked well. Toppings included roasted red peppers, choirzo sausage and cheese curds. This pizza was full-flavoured and seriously took care of my pizza craving. I traded a few slices in return for bites of other dishes on the table and each person loved it too. I took a few slices to go and the whole drive home all I could smell was this pizza. Even though I was having a food baby, the aroma was making my mouth water. 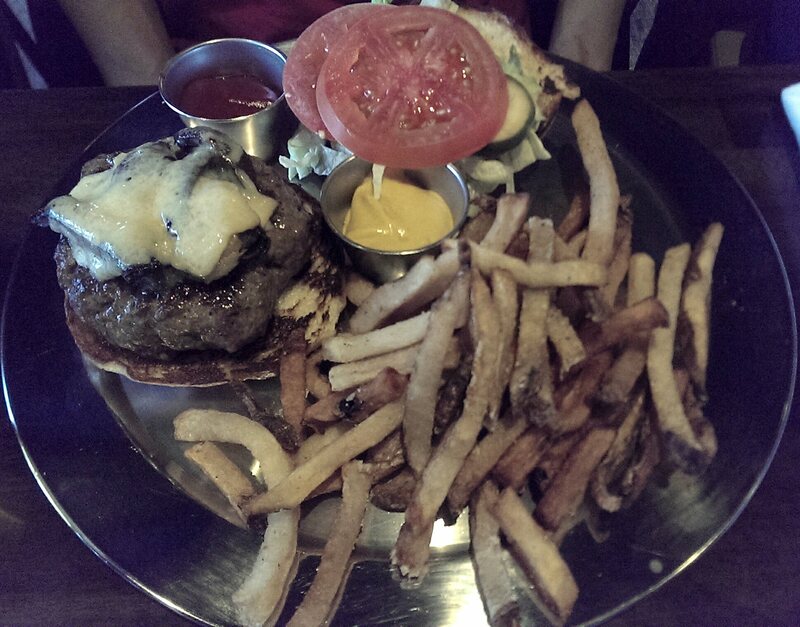 My partner in crime had the Alberta high river smokey mountain ground brisket & sirloin burger. Try saying that five times fast – it’s a mouthful, and so is this burger! It could feed a small country. It’s basically a meatball on a bun, and the consumer wasn’t really feeling that. There was a lot of beef and I believe if it was flattened out a bit with a more substantial bun it would improve the eating experience. Because there was so much juicy meat, the bun was ruined within a couple bites and it just became a huge mess. I had a couple bites and it definitely was delicious – obviously high quality meat and so juicy. 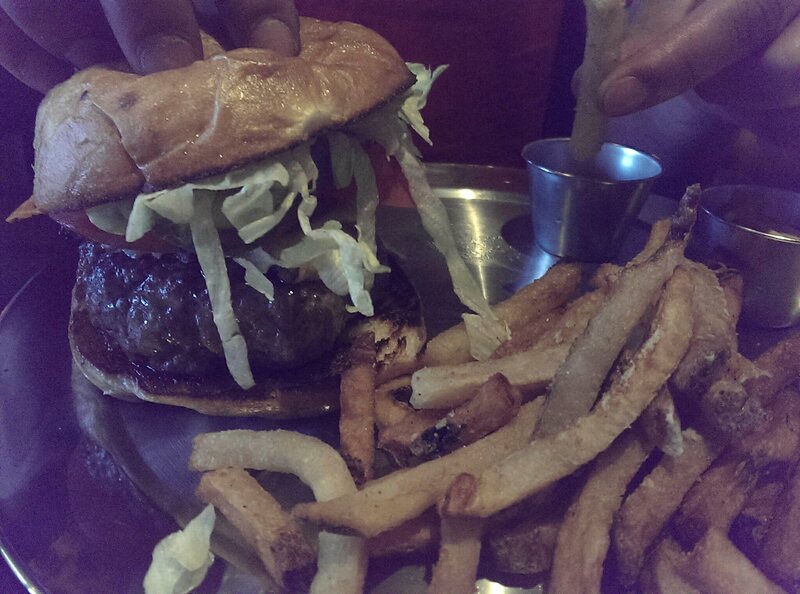 Just a couple of adjustments will make this burger even better! The fries were also stellar. 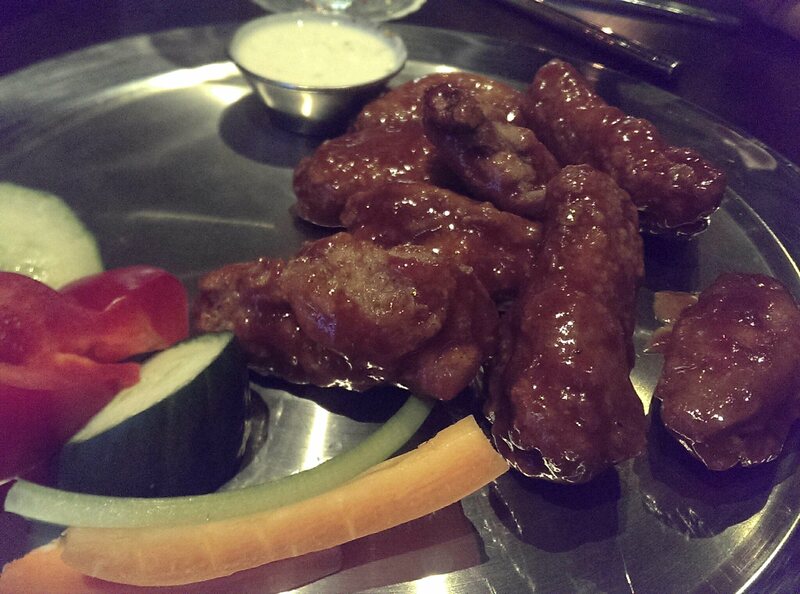 My bro ordered the chicken wings which came with the chef’s chili lime yogurt – the sauce of the day. They were served dry with the sauce on the side. Now, unfortunately my brother and I weren’t really impressed with these in the beginning. The wings were pretty small for what you’re paying ($18 for a pound), no seasoning on the wings and the sauce was watery and lacked any real flavour. We brought this to our servers attention and she immediately took them back to the kitchen to toss them in a different sauce. They came back with a BBQ and Sriracha sauce which was a huge improvement. This sauce had the kick my brother was looking for that the chili lime yogurt was missing. 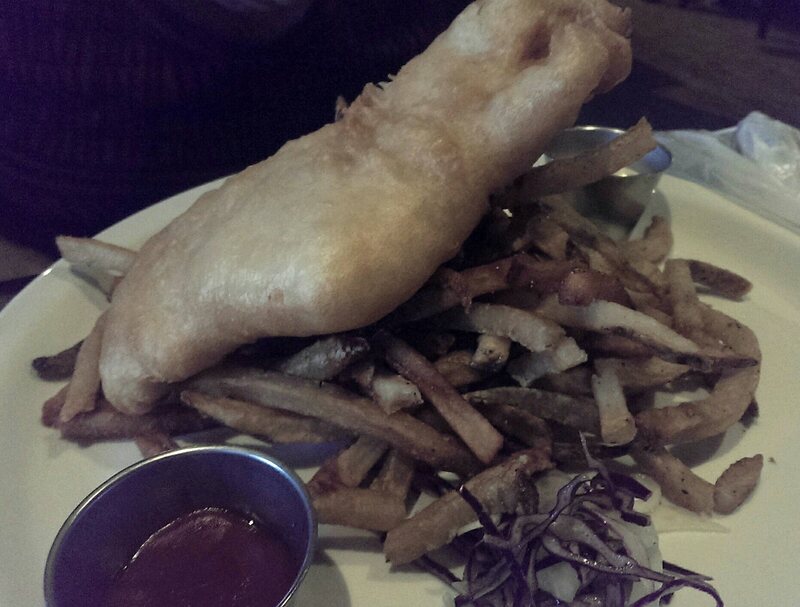 My g-ma had the fish & chips (from the lunch menu) which was a beer-battered haddock, side of fries and Chef’s slaw. My grams is a fish & chip aficionado to say the least. It’s basically all she ever orders, unless prime rib is available, then she’ll most definitely order that. She really enjoyed her meal and said the fish was cooked perfectly, full of flavour and the batter was light and crispy. 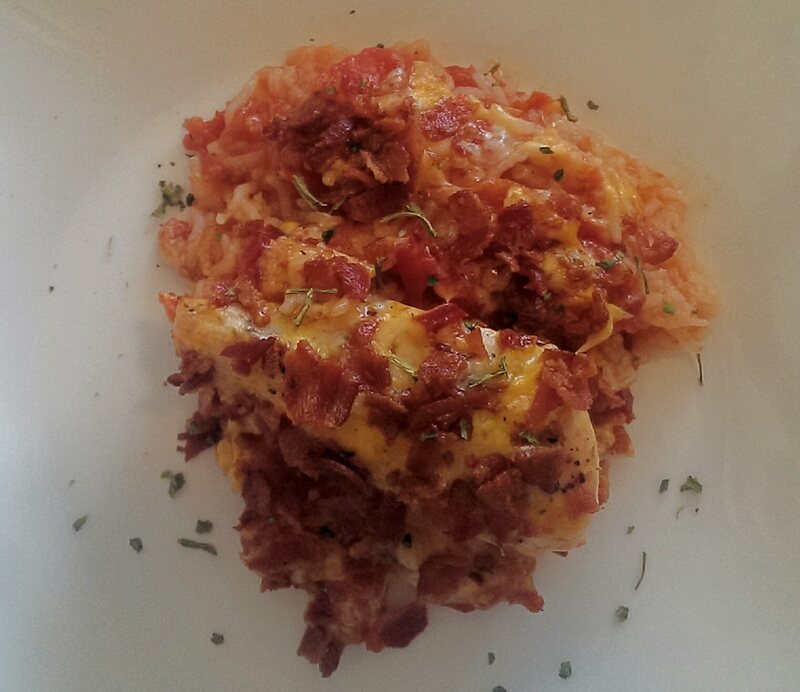 So, two thumbs up for this fish dish – if it impressed my grandma, it should do the same for you! 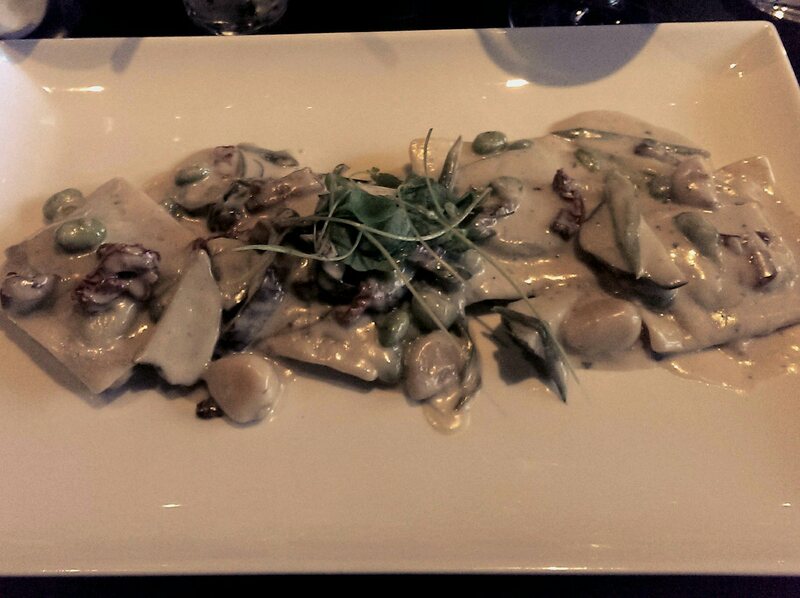 Two others in our group ordered the wild mushroom jumbo ravioli, one with meat and one without meat. The pasta was stuffed with smoked bacon and topped with sundried tomatoes, edamame beans and smothered in an amazing thyme fused cream and white truffle oil drizzle. I got to try a bite of this one and was really impressed. The sauce was so rich and flavourful and the ravioli was cooked perfectly. Definitely a must try! The only complaint here was that no freshly ground pepper was offered, which would have finished the dish off well. We notified the owner (at the end of the evening) and he ensured us he would let his staff know. Again, not a big problem! 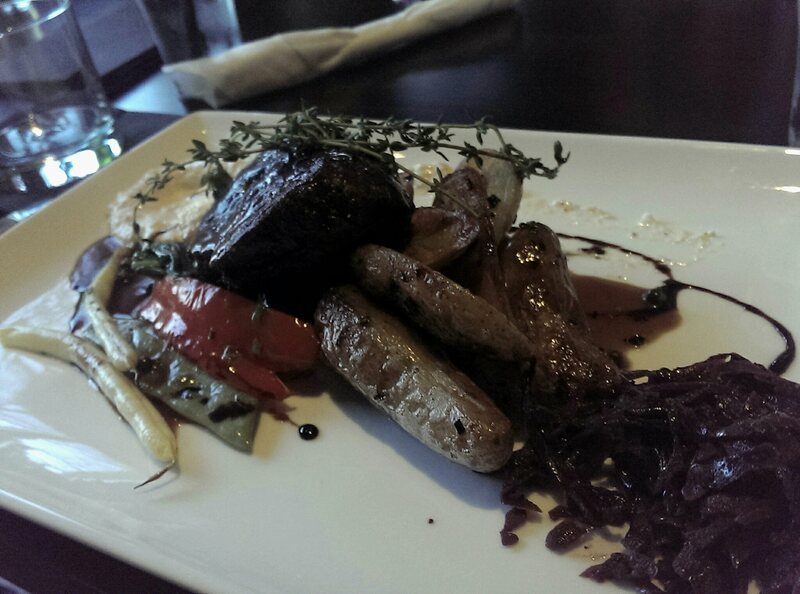 Another dish we ordered was the beef tenderloin. I didn’t get a chance to try it, however I was told it was delicious, cooked to their liking and had minimal traces of fat. The plating was beautifully executed with a nice variety of sides to accompany it including baked potato wedges and roasted veggies. 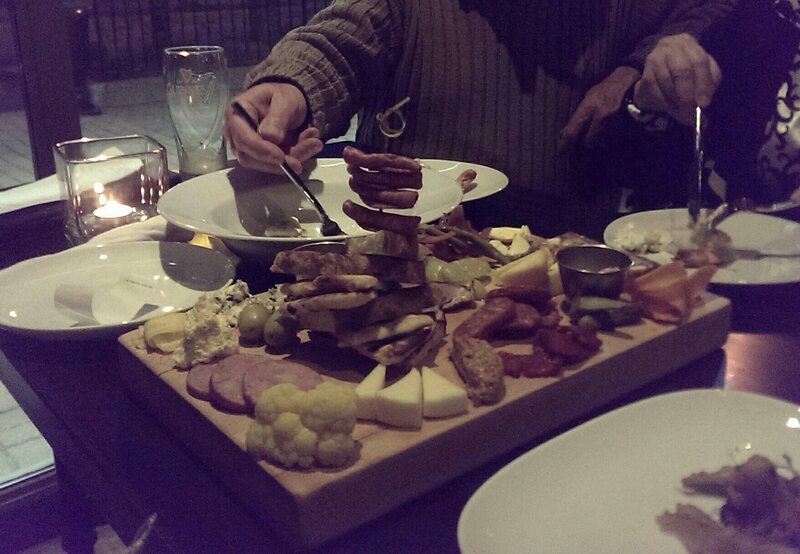 We also ordered the T34 Charcuterie. This thing is so badass – there’s no better way to serve Charcuterie than on a large chopping block! I didn’t get to try any of the items as this couple arrived a bit later than us and we were all pretty well stuffed by the time it reached the table. It comes with an assortment of cured and smoked meats, pate, mustard’s and relishes, pickled vegetables, three cheese assortment, rustic bread and pickled quail eggs. A little bit of everything! A charcuterie is the perfect way to share a meal with a number of people. 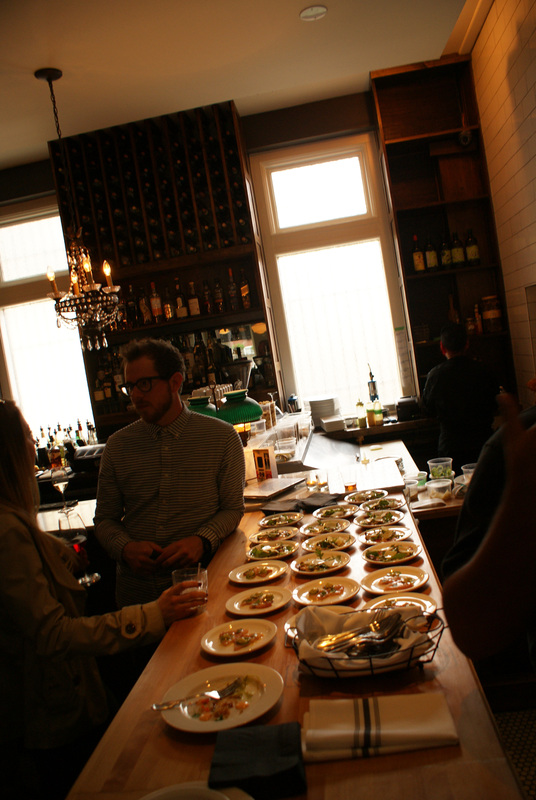 It encourages conversation and a shared food experience. Everything was beautifully arranged and prepared fresh. This is definitely something to try when you visit. 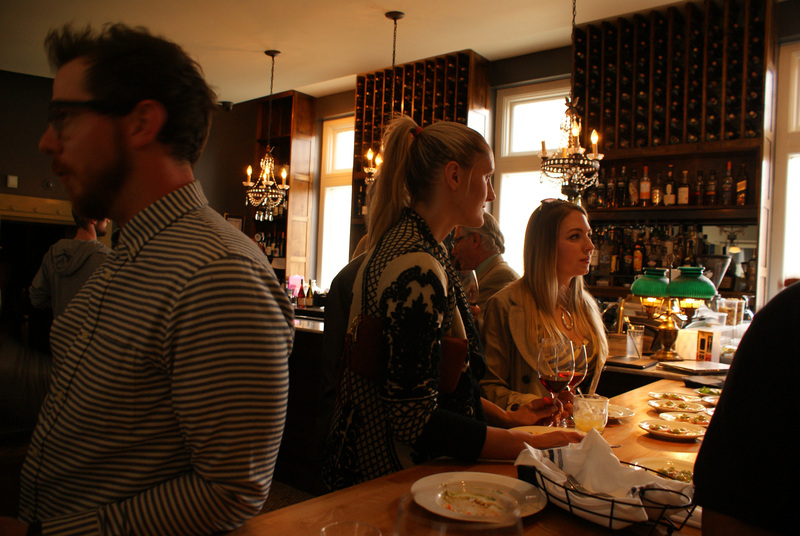 The bottom line here is that Table 34 is a great new spot in downtown Burlington. A few kinks need to be worked out but there’s no questioning the quality of the dishes here. You might leave with your wallet feeling a little less full in comparison to your stomach, but it’s well worth it. Everyone deserves to treat themselves once and a while and this could be the place to do that. The food was prepared fresh and served hot, the staff was incredibly attentive (shout out to our server Andrea for making our night extra special). The restaurant has such a warm, relaxing atmosphere and it’s obvious the owner really cares about the happiness of his guests. I watched Moe visit each table that night, making sure everyone was enjoying their meals and having a positive experience. I have no doubt that this restaurant will thrive and continue to grow with much success! Table 34 is located at 1455 Lakeshore Road East, Unit 3 on the corner of Lakeshore and Locust Street. This is the perfect soup to make on a cold winter day, or any day for that matter. Just be prepared to set aside half of your day to make this flavourful, indulgent soup. This recipe has been handed down to me from my Hungarian grandmother. I’ve attempted it only twice in my life since recently sitting down with her to record the recipe for myself. Everything about this soup brings back wonderful memories of visiting my grandma and grandpas place when I was younger. 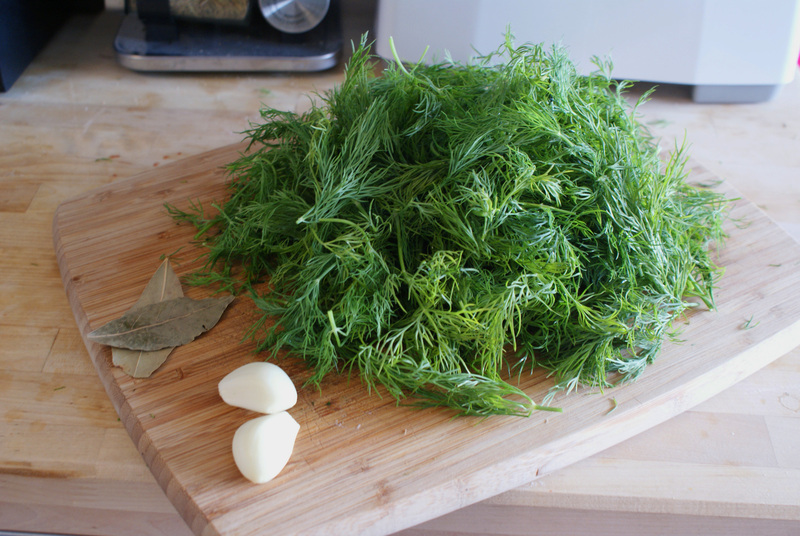 There’s nothing better than the smell of dill that fills the air when this soup is on the stove. 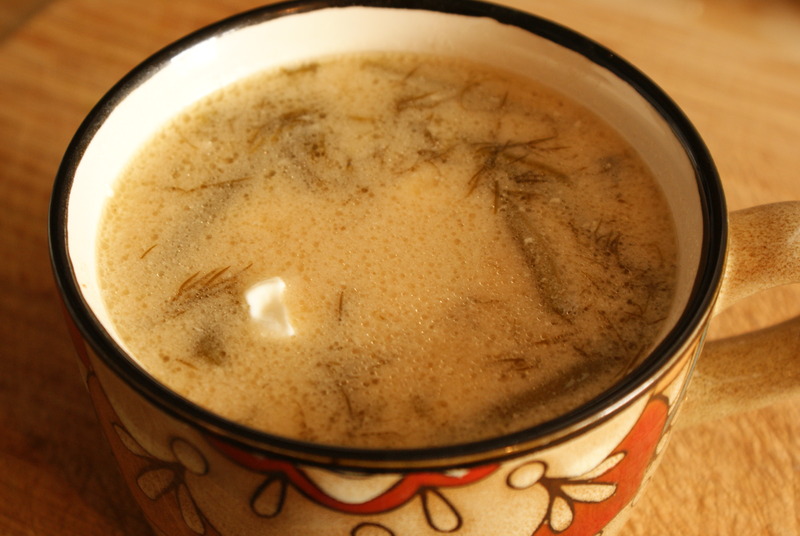 Hungarian green bean soup (Friss Zoldbab Leves) combines fresh dill with green beans and sour cream to make a creamy, full bodied soup. 1. 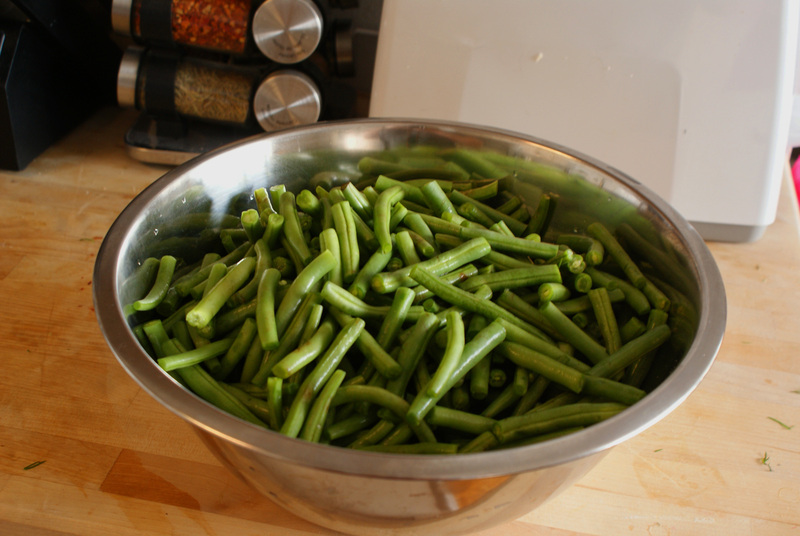 Prep green beans by cutting off the tip of both ends and cut into halves. Rinse well under cold water. 2. Fill your extra-large pot with cold water (approx 15 cups). Make sure that the beans are fully covered with water. 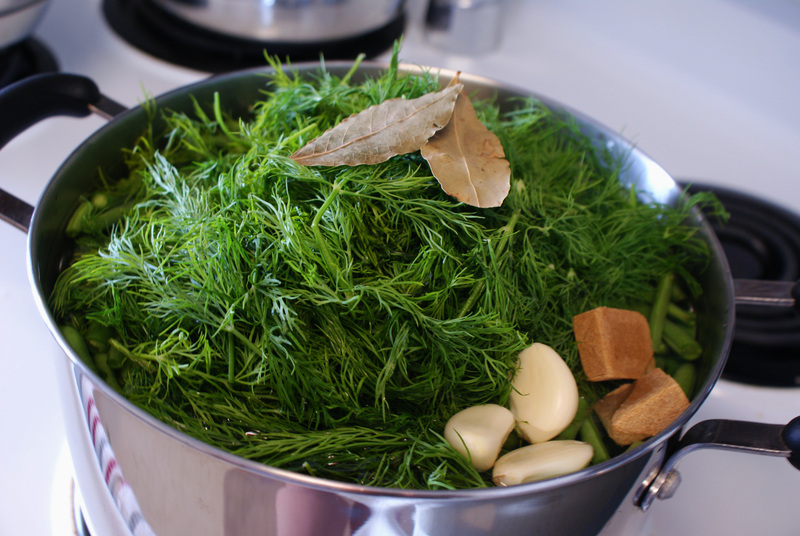 Add in the garlic cloves, dill, bay leaves, bullion cubes and salt. Stir to combine and boil on low to medium heat for three hours. 3. When there’s approximately 40 minutes left, begin to prepare the roux that will be added to the soup. In a small sauce pan, bring 2 cups of water to a boil, set aside. In a small, deep metal frying pan, melt the bacon fat at medium temperature. 4. 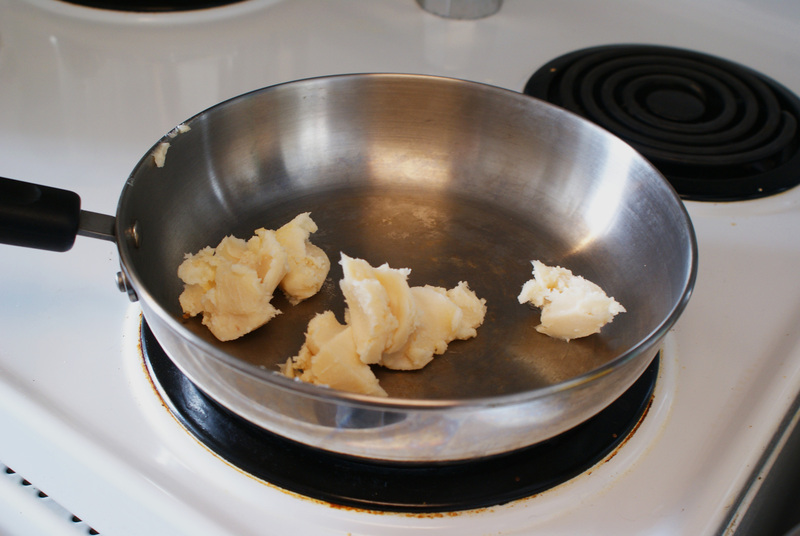 Once the bacon fat has melted, gradually add 6-8 tbsp of flour – stirring constantly. 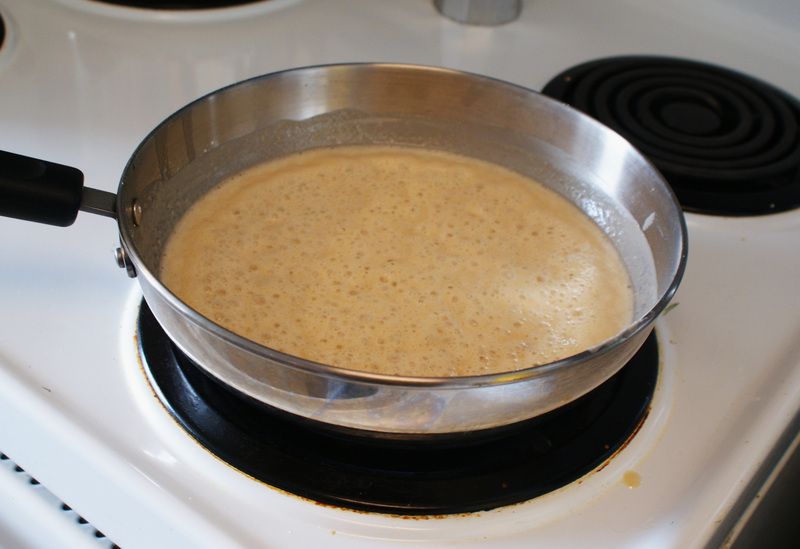 Continue to stir until the roux turns a dark orange colour and the consistency is like smooth peanut butter. At that time, slowly add the boiling water and continue to stir until all lumps are gone and the mixture is smooth again. Slowly add the roux to the soup, folding it in. 5. 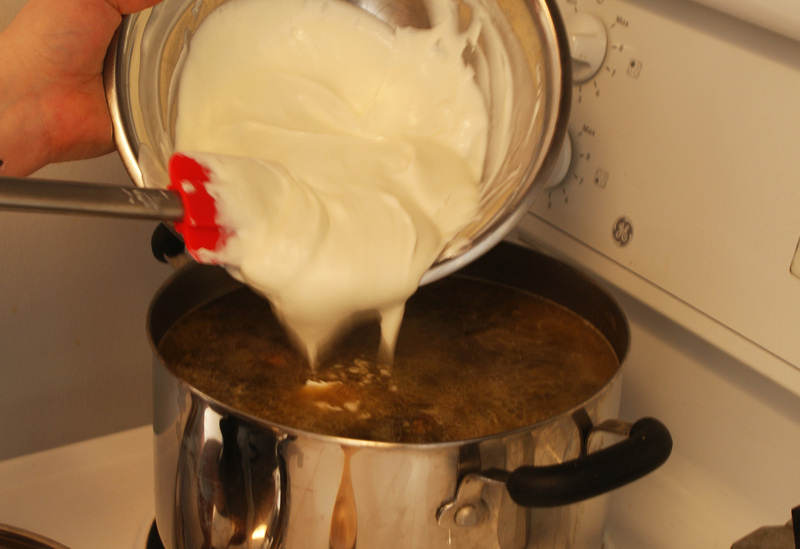 Prepare the sour cream mixture. 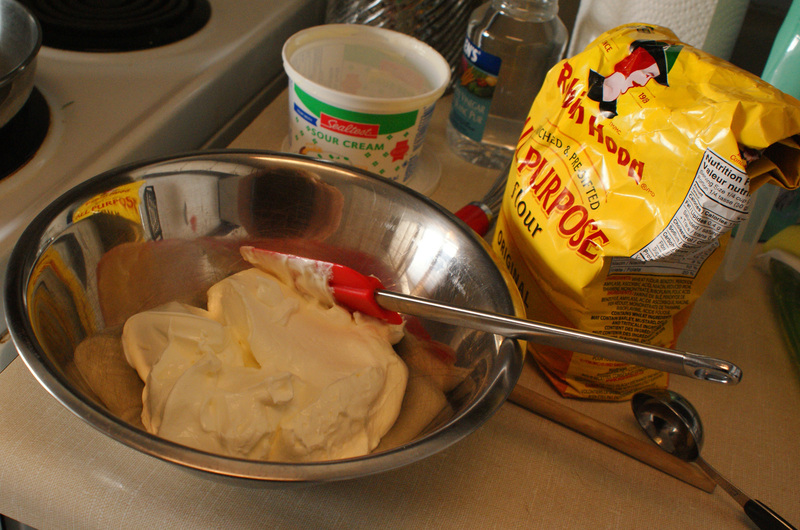 Empty the sour cream into a medium sized bowl. 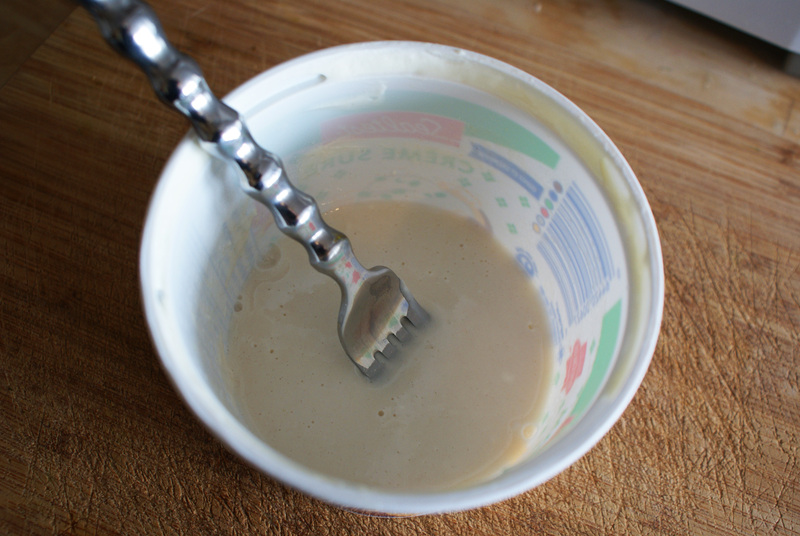 In the empty sour cream container, combine 3 tbsp of flour and 1/2 cup of cold water- mix until blended. 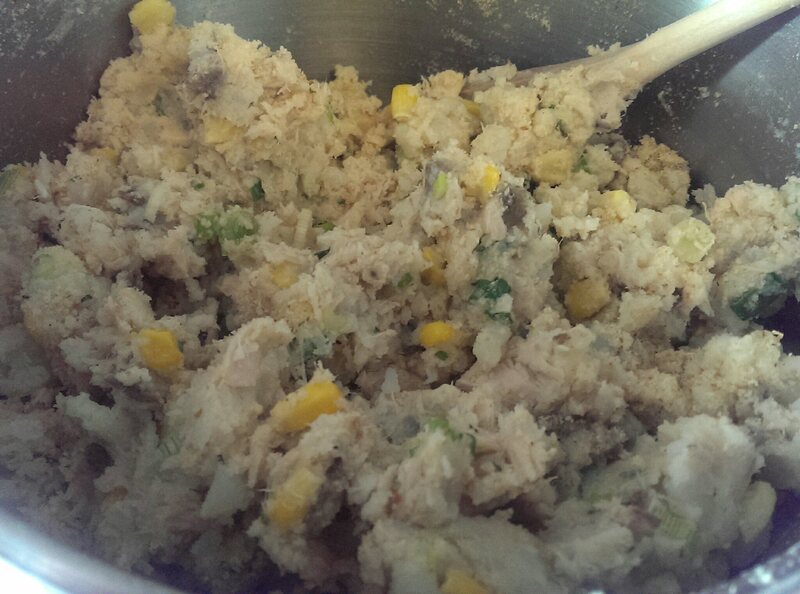 Add to the sour cream and combine. 6. Slowly add the sour cream mixture to the soup. Stir well. 7. Add 5-6 tbsp of vinegar and 1 tbsp of lemon pepper to the soup. Continue to boil for an additional half an hour. This is by far one of my favourite soups to make at home. It’s an enjoyable, relaxing experience and it fills your home with enticing scents. This recipe makes about 4 liters of soup. That’s a lot of soup! 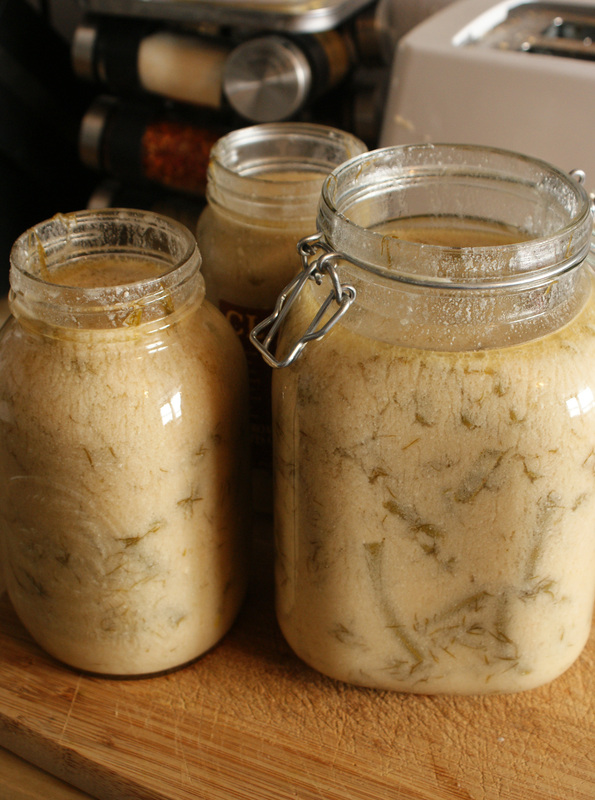 I like to jar some up and give them to my family and friends to enjoy. I also save some for my grandma of course. Her recipe will live on in our family for years to come. I hope your family will enjoy it too! Preheat oven to 400 degrees. 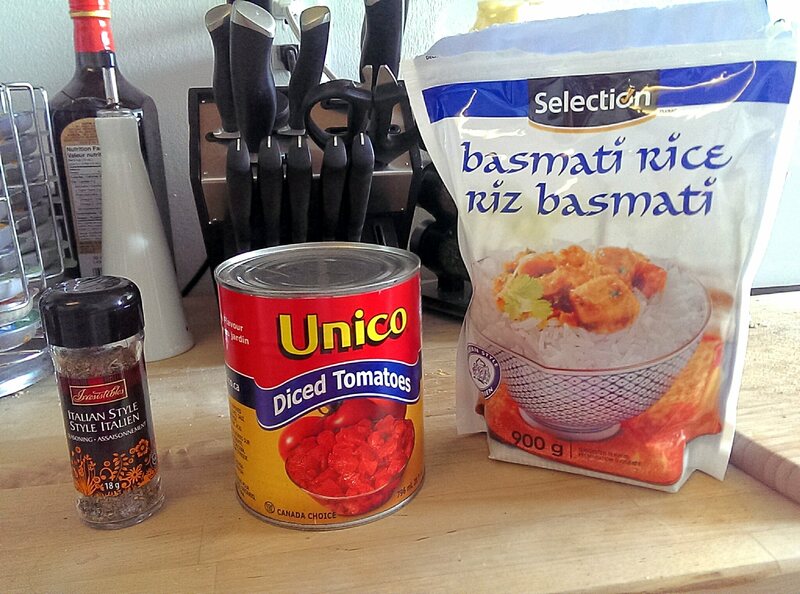 In a 9×12 baking dish, combine the diced tomatoes (with juice), rice and half of the Italian seasoning. 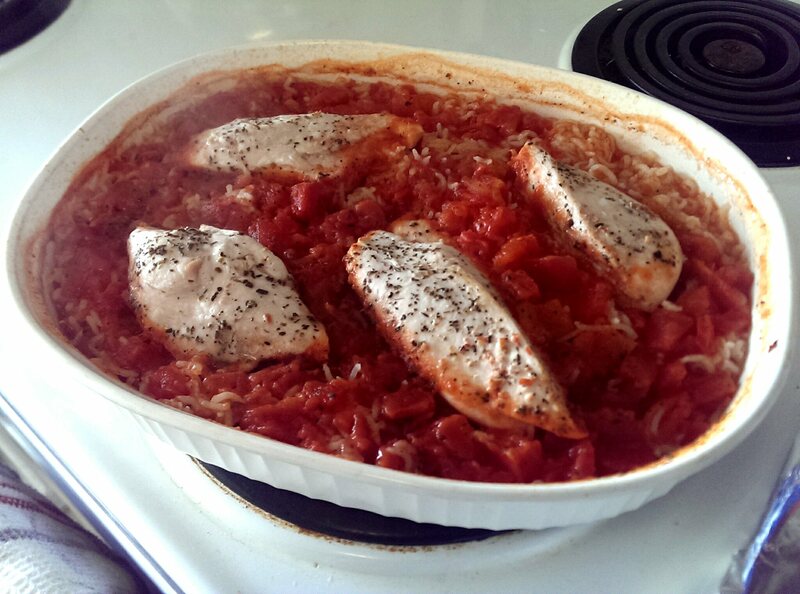 Place chicken breasts on top of tomato mixture. 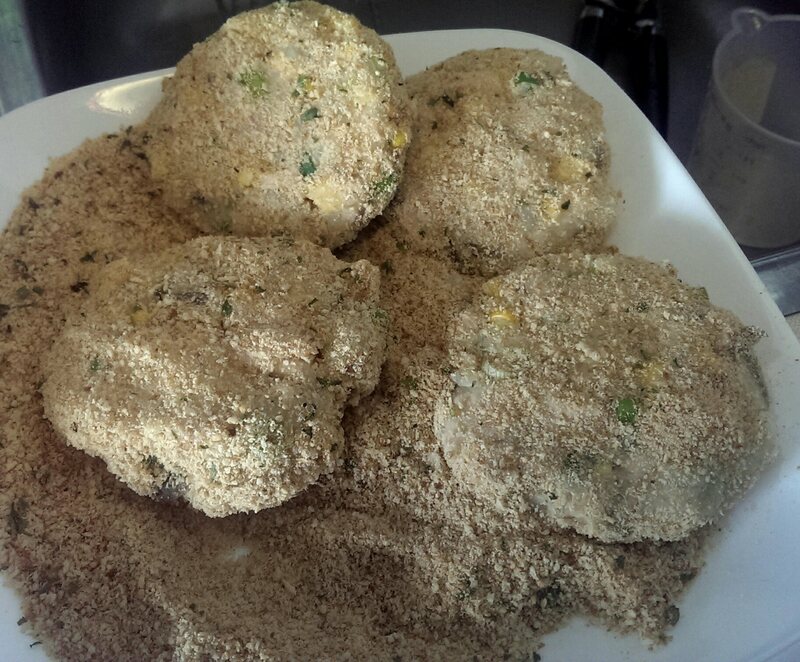 Sprinkle with salt and pepper and remaining Italian seasoning. 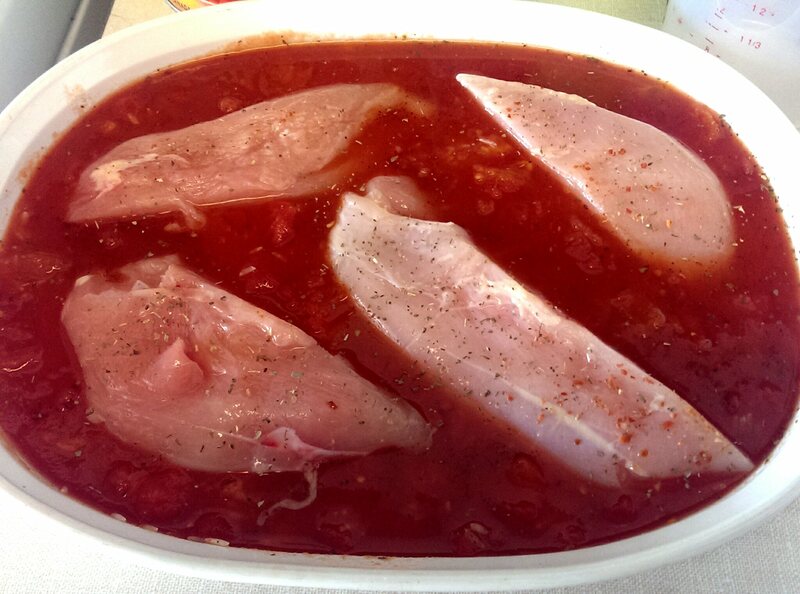 Cover with tinfoil and place in preheated oven for 45-60 minutes, based on size of chicken breasts. Check the chicken once or twice to be sure that it is fully cooked. 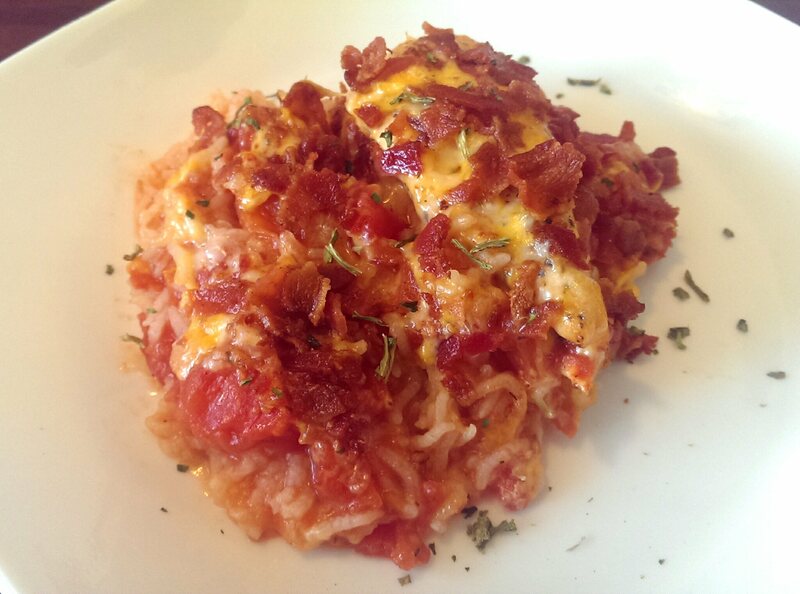 Also check to see that the rice is fully cooked from the tomato juice. If not, add a 1/4 cup of water and cook for another 5 minutes. 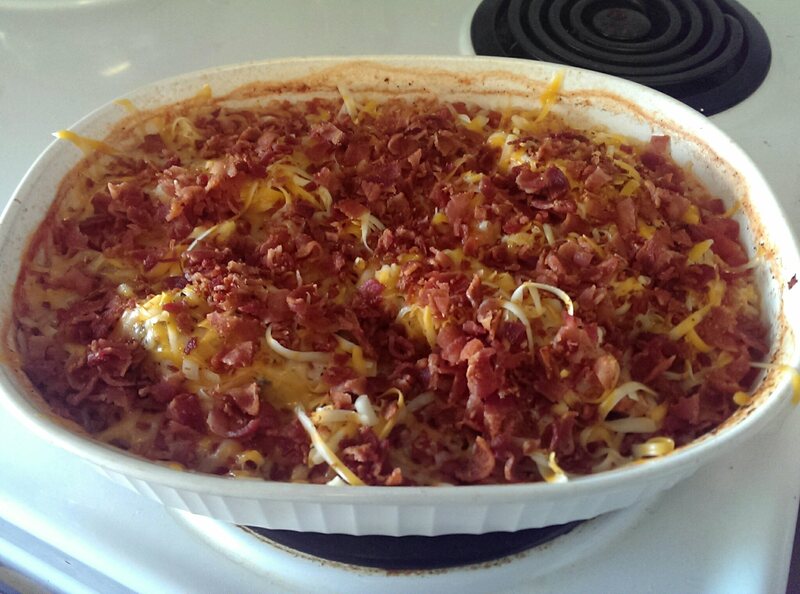 Once fully cooked, sprinkle shredded cheese and chopped bacon on top and return to the oven until the cheese has melted and started to lightly brown. Approximately 5 minutes. Garnish with dried parsley flakes. Serve immediately. I served this dish on its own as it was pretty filling but a fresh salad or grilled vegetable would be a great addition. 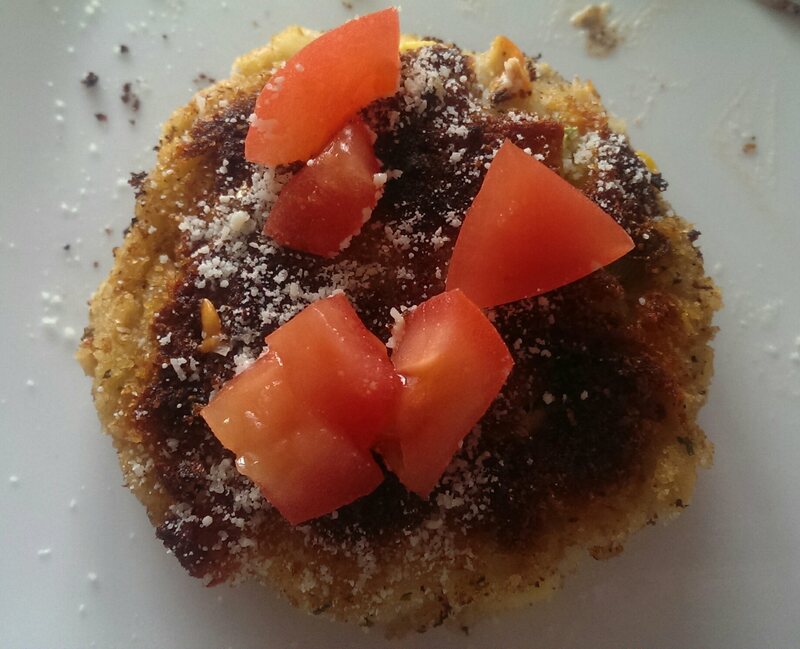 The tomatoes bring a juicy freshness, combined with the gooey cheese and crunchy, salty bacon, it’s to die for! Try this out and give me your feedback in the comments below! I’ve been fortunate enough to have visited Spain three times in my life. My first encounter took place during my high school years. My parents had recently split up and my father had taken work in Barcelona. Since he was going to be there for an extended period of time, he promised I could come visit. So, at around the age of 14, my brother and I set off on a plane to live in Barcelona for a couple of months. This was an experience I will never forget and I always tell people, I left my heart in Barcelona. Since then, I’ve visited with my family a couple years ago and went backpacking with friends this past September. This city is unlike any other. The people, culture and food provide such a rich and unforgettable experience every time. The night life is something to be experienced as well. I’ll always remember our first night in Barcelona with my family. Our body clocks were still in a different time-zone, and we were standing on the balcony at 4:00 AM on a Thursday morning. Our apartment was situated across from the Puerto Olímpico where the marina is lined with bars, lounges and restaurants. What we saw wasn’t your typical Thursday suburban morning commute, but a bustling down town city scene with people still leaving the bars and clubs. 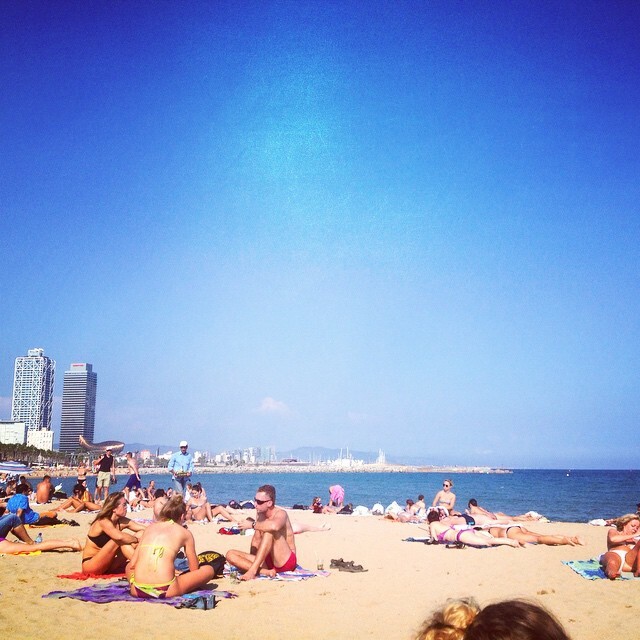 On my most recent visit, backpacking with friends, our visit to Barcelona was short but sweet. We only had a handful of days to take in the sights and immerse ourselves in the culture. I have to say we did pretty good with what little time we had. Being so close to the beach (2 minute walk) we had easy access to amazing beach bars and restaurants. This was a huge must for me when booking our stay in Barcelona. I knew I wanted to be close to the water, not just for the beauty of the beaches, but the food and drink options too. 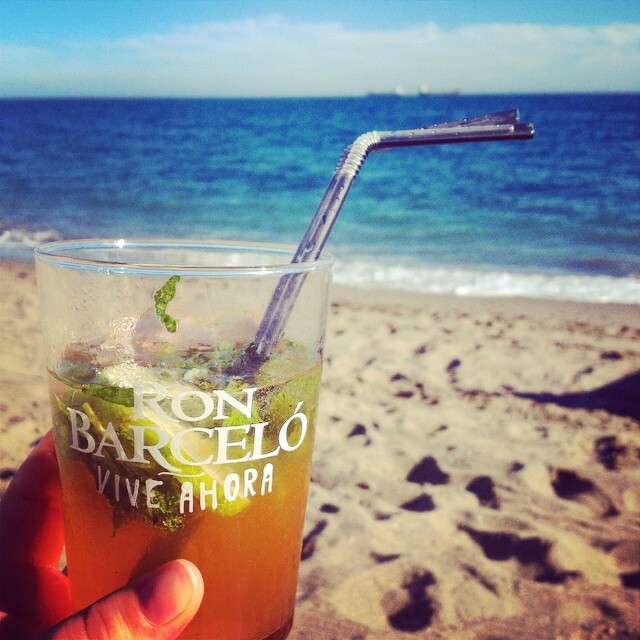 Barcelona (anywhere in Spain, really) is the perfect place for delicious Mojitos and Sangrias. They know how to make them right every time and won’t cheap out on the alcohol. It’s an amazing experience being able to lay on the beach and walk only a few steps for a refreshing alcoholic beverage. Many of these little spots will serve tapas and small meals. 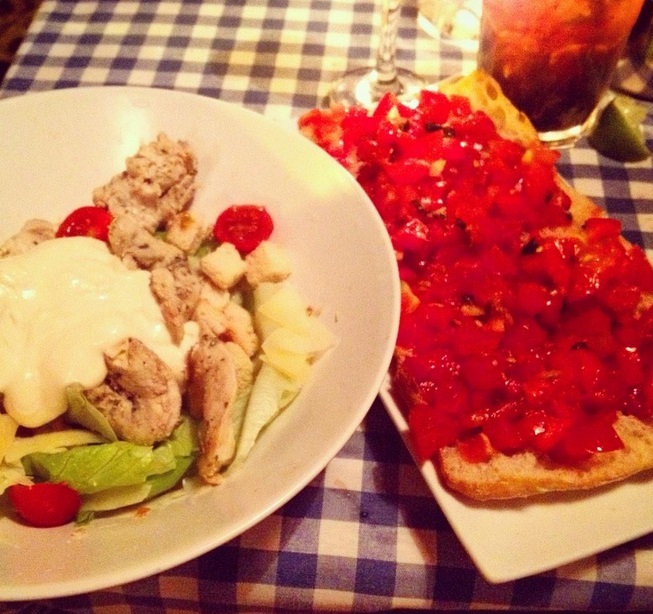 We shared a delicious bruschetta appetizer and chicken caesar salad during one of our many visits. We decided that Barcelona would be one of the cities where we would splurge on a fancy meal. We were on a pretty tight budget but at the same time, wanted to make sure we were’t selling ourselves short of any great culinary experiences. I have a favourite restaurant in Barcelona that I visit each time and knew my friends would love it just as much as I do. 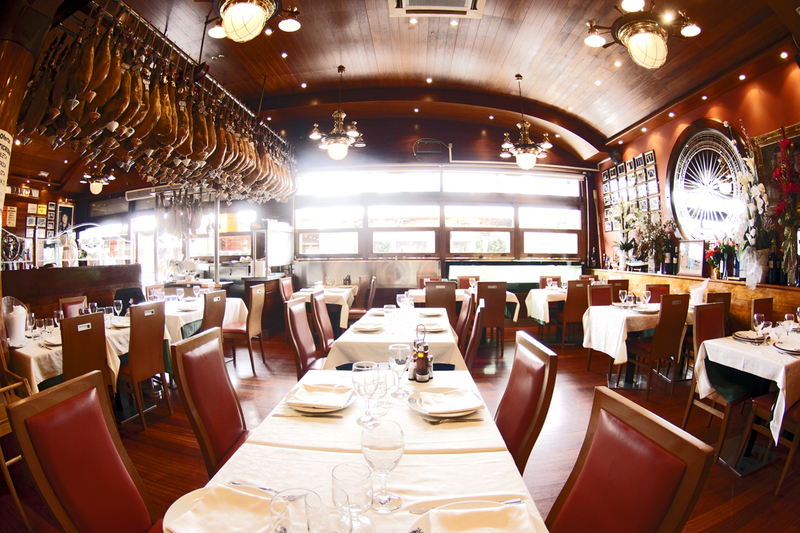 Restaurante La Barca del Salamanca is one of many amazing restaurants situated at the marina. 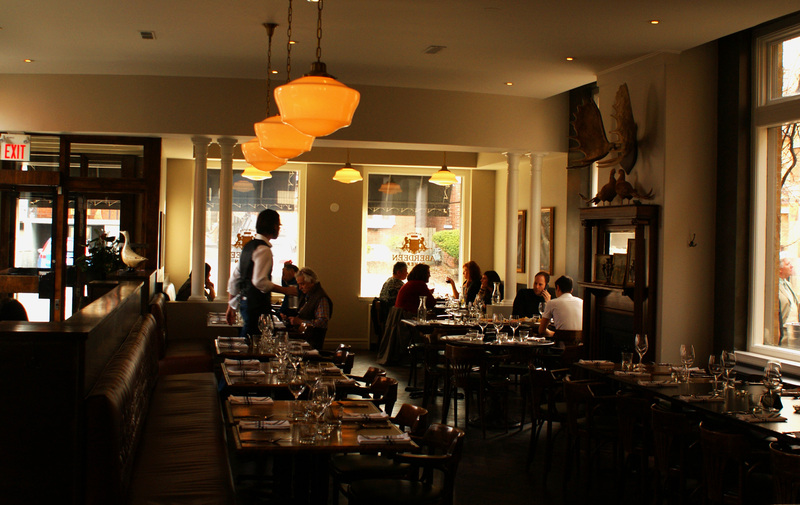 It’s always busy, but with a huge staff and large dining area, the service is simply outstanding. The wait staff are friendly, kind, funny and always up for a chat. One gentleman I am very fond of has been there each time I have gone with family. Although he doesn’t remember me (I don’t blame him! ), I’ll never forget his funny, professional and welcoming demeanour. We treated ourselves well on this night and made sure to order what we knew we would enjoy. To begin our meal, I ordered Jamón Serrano (cured ham) and my friends ordered Gazpacho (cold Spanish soup), and a seafood plate. 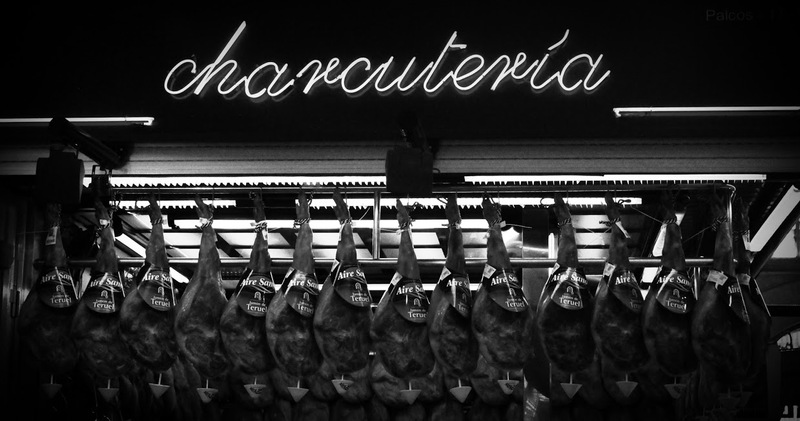 Anywhere you go in Spain you’re guaranteed to find delicious, cured hams that are perfect for sharing (only if you want to). 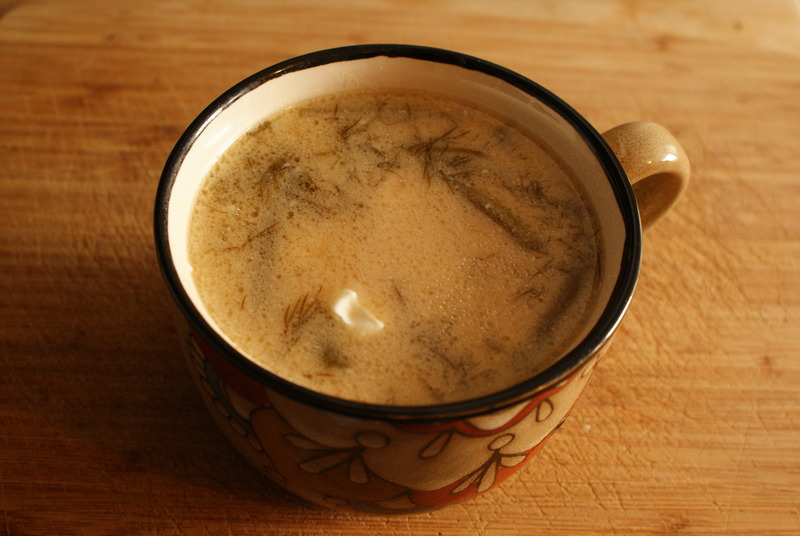 Gazpacho is a unique soup made of raw vegetables and is traditionally served cold. The picture above shows the soup we had without the vegetables added. They came on the side so you could put the amount you desired. 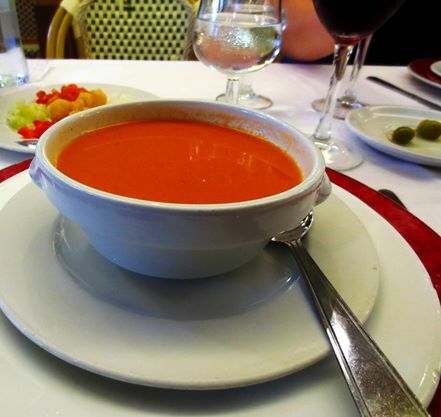 It is a vibrant, flavourful and refreshing soup on a hot summer night in Spain. Toast rubbed with garlic, tomato and olive oil was also brought to our table. 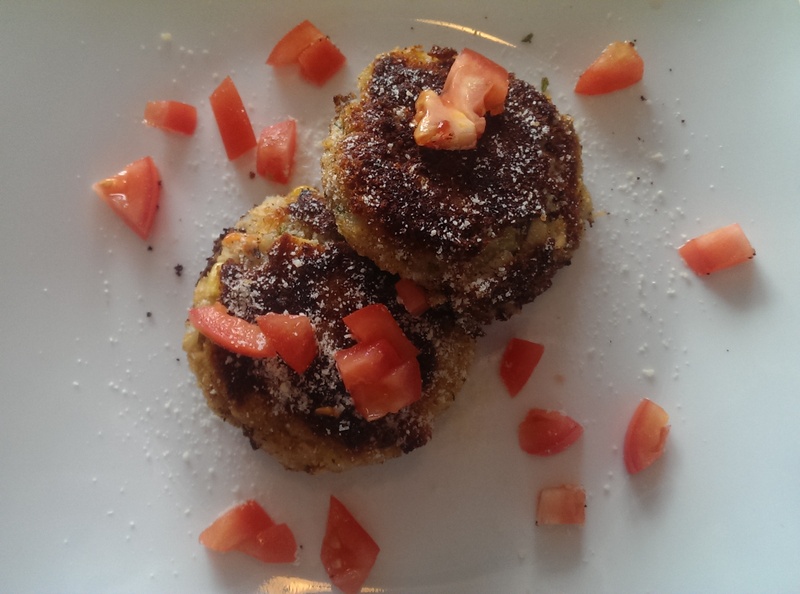 This is a common tapas or starter dish in most Spanish cities and was also delicious. For our main course my friend and I shared the seafood Paella. When it first arrived at our table I thought to myself ‘this could feed a small country’ but we managed to get through pretty well the whole thing, that’s how delicious it was. 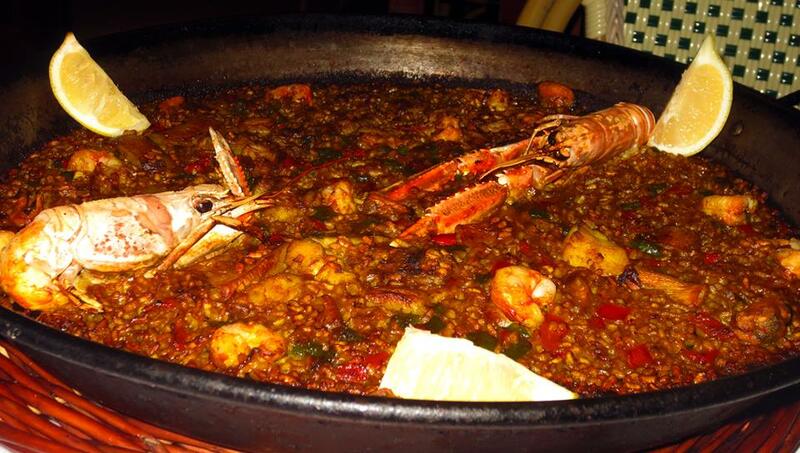 Paella is regarded as Spain’s national dish but is traditionally a Valencian dish. Saffron and Rosemary are common seasoning in Paella dishes and the use of a cast iron Paella pan gives the rice and contents a smoky flavour and crispy texture. With a squirt of lemon, this dish was outstanding and a great way to celebrate our time in Barcelona. At the end of our evening at La Barca, we decided we didn’t need dessert. Mainly because we were so full we couldn’t possibly stomach any more food. That was until, of course, our server brought over a plate of lemon tarts and a bottle each of apple and lemon liqueur. We enjoyed many shots and countless lemon squares which definitely ended our culinary experience on a happy note. 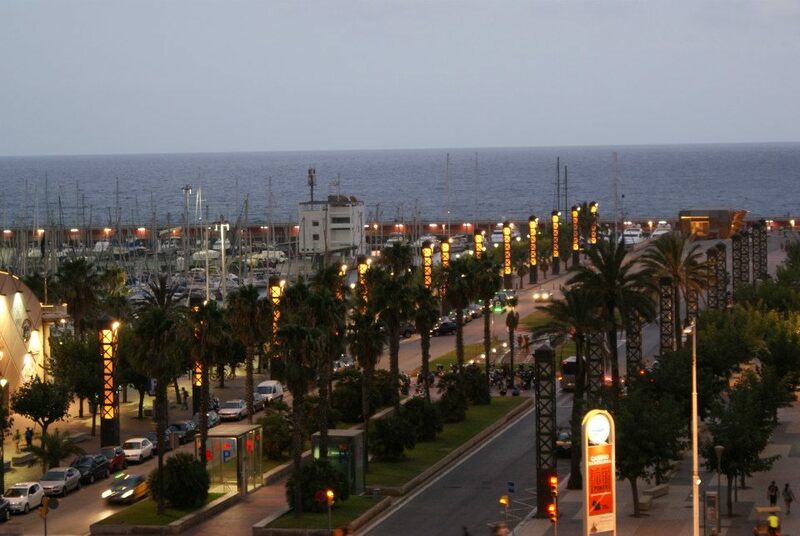 If you are ever near the Marina in Barcelona, please stop by and check out La Barca. You won’t be disappointed. On many occasions during our days out in the city, when needing re-fueling we would stop to grab a quick bite of tapas. 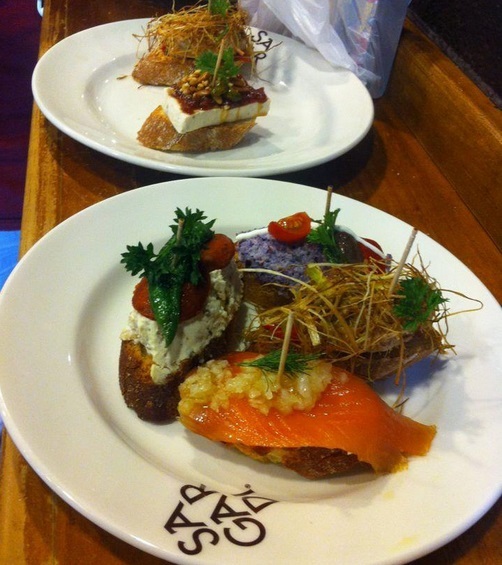 Tapas is a Spanish cuisine that consists of small appetizers and snacks. We often ordered Patatas Bravas (fried potatoes with spicy tomato sauce or white aioli), Croquettes (small fried rolls of mashed potatoes and/or meat), toasts (sliced baguette with varying toppings of meat, vegetables and/or cheese) and Caprese salads (sliced tomato’s topped with fresh mozzarella and basil). Selections like these are meant to inspire and invoke conversation as those enjoying them are not focused on eating large meals. 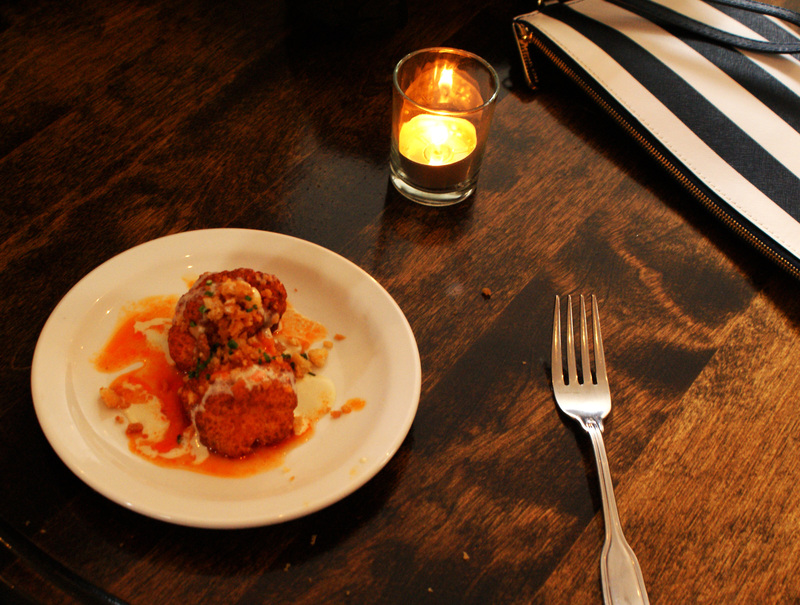 You’ll often find places that serve tapas have limited seating as to encourage diners to move around and converse while eating. In Barcelona there’s something for everyone to enjoy, whether you prefer steak over seafood or are content with a small snack, you can find it here, done right. Rather than a fast food chain on each corner, you’ll be happy to find a small tapas bar or restaurant serving authentic, fresh Spanish cuisine. I’ve been waiting for quite a while (almost a year) to try this place out. I don’t know why it took me so long but that’s besides the point. I finally made it!. Since I’ve moved to Hamilton, whenever I talk to people about restaurants to try in the area, the Bread Bar is always one of their top suggestions. My dad wanted to come to Hamilton for dinner last week and it didn’t take much convincing on my part to get him here. He checked out the menu beforehand and was just as excited as I was. As most of you know, traffic coming into the city during rush hour is rage inducing, so it comes as no surprise that my dad didn’t make it for 5:30. While I was waiting for him to arrive, I decided to sit at the bar with a nice glass of red wine. The staff was very attentive, keeping me company while I waited and ensuring I had everything I needed. At the bar they have bowls perfectly arranged with a selection of their house pickles, carrots and other veggies. I actually didn’t get to try any but they looked delicious. I think this is a really good idea in lieu of bread. It’s always nice to have something to snack on while you’re waiting for your food (or your dad) to arrive, and I think these veggies are a great alternative. To the right of the bar is a beautiful and tempting display of their baked goods. Their pies and cookies look phenomenal and there’s pizza available by the slice. Directly across from this display is a cold fridge where you can buy a pie or a selection of their desserts to take away. While I was sitting at the bar, sipping my wine, I watched one of the staff cutting the apple pie and I just thought to myself, you won’t find anything like that in a grocery store. A short while later my dad arrived (fist pump!) and we managed to get a table right away. I had been scoping out the room for guests that were finishing their meals as I was waiting and was able to score a table for two by the window. I mentioned that I really wanted to try the kale Caesar salad and luckily my dad was all for it. The kale leaves were very tender and added a wonderfully earthy flavour to the traditional Caesar taste. I’m most familiar with the curly-leaf kale compared to the flat, more tender leaved kale used in this salad. I’m not sure which variety of Kale they used here but I intend to ask next time I visit because it was delicious. I was really impressed with how well balanced this salad was, especially because the kale leaves were so soft, a heavy dressing would just drown the salad. 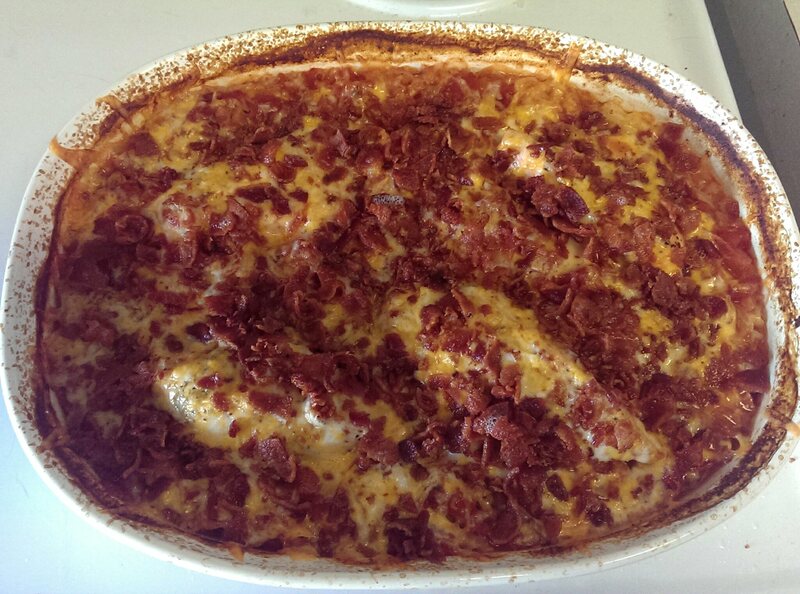 It’s topped with a fair amount of parmesan, bacon and strips of white anchovy. I normally wouldn’t eat anchovies (on anything) but I promised myself I’d try new things. I’m glad I did because they were so tasty! They weren’t as salty as I remember anchovies to be and actually complimented the salad nicely. Mmmmm pizza. I love a good pizza. We got our own individual portions which were out of this world. The stone baked dough was crispy, fluffy and had almost a creaminess to it. My dad ordered the Bee Sting pizza which has tomato sauce, mozzarella, local honey, chillies, ricotta cheese and strips of spicy salami. The ricotta on this pizza is perfect because it provides a wonderful balance against the sweetness of the honey and heat of the chillies. Sweet and spicy go together like peanut butter and jelly. I think its a brilliant idea to pair them on a pizza. Needless to say, it works and it’s delicious. I ordered the Vampire Slayer. Not only is the name awesome but this pizza has brie on it. I’m a sucker for cheese to begin with but brie? C’mon, I can’t resist. It comes topped with a white béchamel sauce, roasted garlic cloves and arugula. There’s something about leafy arugula on a pizza that makes you think you’re eating healthy. The garlic wasn’t as overpowering as you might think. Roasting the garlic tones down its potency and brings out its natural sweetness. It was a delicious addition to the pizza combined with the creaminess of the sauce and melted brie. Thankfully, by opting to take some pizza home, we had room in our bellies to try some dessert. My dad initially wanted to try one of their peanut butter cookies but once we heard about the cheesecake they had that night, we couldn’t resist. It was topped with caramelised pears and drizzled with a sweet brandy sauce. The cheesecake was so creamy and melted in your mouth like cheesecake should. The pears were soft but still firm enough and provided a wonderful texture and sweetness alongside the brandy sauce. I’m going to go ahead and say this is the best cheesecake I’ve ever had. No lie, I will tell my grandchildren about it. Earth to Table: Bread Bar is Located at 258 Locke Street South in Hamilton. If you’re from around here, you probably know there’s little to no parking on Locke Street, especially around dinner time. It’s best to find a free spot on a side street and walk over.